IN THE WORLD OF parenting, we’re conditioned to treat anticipated transitions as cause for celebration – like when a child reaches a new developmental milestone or advances to the next grade. And we’re led to believe that sooner is usually better (think potty training). But this way of thinking has its limits and it’s particularly problematic when it comes to car seats, where the safest approach is to take time with each transition. Whether you’re moving a child from a rear-facing seat to one that’s forward-facing or a child is “graduating” from a five-point harness to a booster seat and ultimately to vehicle seat belt use – it’s best to make these changes as late as possible. The same holds true, by the way, for moving older children from the back seat to the front – which, in case you’re wondering, isn’t generally recommended before age 13. With respect to transitioning from rear-facing to forward-facing, the consensus of the American Academy of Pediatrics, Safe Kids Worldwide and the National Highway Traffic Safety Administration is that children are safest when kept rear-facing as long as possible within the height and weight limits of their rear-facing car seat, which typically translates to age 2 if not older. As with most aspects of parenting, however, actually committing to keep toddlers rear-facing longer and following through is easier said than done. I was recently reminded of the additional practical challenges involved when a senator in my home state of Nebraska introduced new and improved car seat legislation requiring appropriate child safety seat use up until the age of 8 (instead of 6), rear-facing until the age of 2, and keeping children under the age of 13 in the back seat. In the spirit of helping this important bill become law, I made my way to the state capitol a couple of weeks ago armed with nearly two decades worth of professional insights and information about the life-saving benefits of the proposed changes. The season for holiday travel is almost upon us, so I thought it best to get down to basics and share some safe and practical travel tips for everyone facing the prospect of packing up the family car or heading off to the airport this holiday season. While I’m all about practicality, I also want to make sure that safety doesn’t inadvertently get left behind (or just plain forgotten) as you set out to share the holidays with family and friends. Avoid flying objects. While car travel certainly eliminates some of the stress of figuring out how to fit everything you and your children will need for your holiday vacation into a single suitcase (or two), don’t lose sight of the fact that anything in the car that isn’t safely secured can, in the blink of an eye, become a dangerous projectile in the event of a crash. This not only includes unrestrained passengers, but any suitcases and other holiday “essentials” you bring along. To keep all passengers safe, keep all loose objects out of the passenger area of the car – tucked in the trunk or otherwise secured. Use appropriate restraint. All too often, parents are tempted to compromise on car seats in the name of streamlined travel and efficiency. But the fact of the matter is child passenger safety never takes a holiday. That means that for anyone traveling by car, each and every passenger needs to be appropriately restrained. For infants and children, this includes age-appropriate, correctly installed car seats. Lap-shoulder belts need to be available for all adult passengers, as well as any children riding in booster seats. Simply using a lap belt alone doesn’t suffice when it comes to safety. For those traveling by air, not only should you plan carefully so that your child can be safely restrained on the airplane (which means an FAA approved car safety seat or restraint for all children under 40 pounds), but also at your destination. While most car rental agencies can arrange in advance to have car seats available, it always safest to plan on bringing your own. 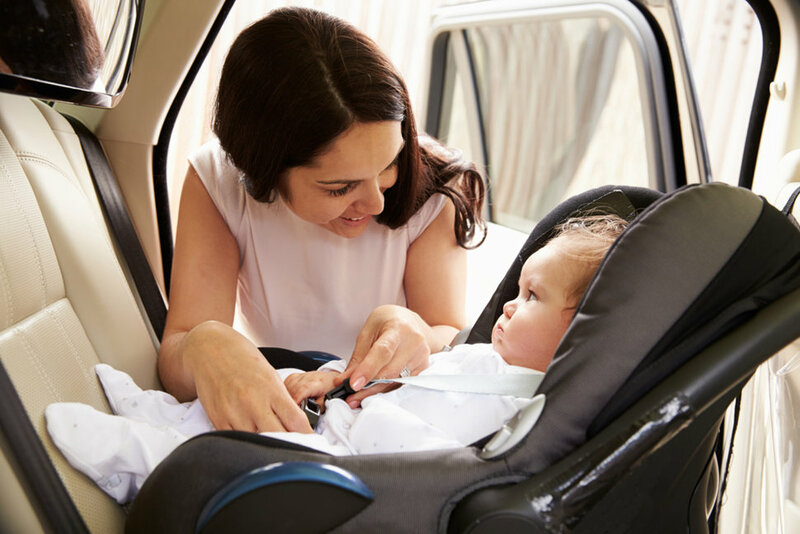 It may mean more to carry, but car seats are a must-have for holiday travel. Dress for the occasion. It’s obviously important to make sure that you pack plenty of clothing to suit the climate of wherever you’re headed – especially given that young children are known to be more susceptible to both hot and cold temperatures. For car travel, remember to consider what you’d want to have on hand should your car break down or get stuck along the way. While it’s not recommended that children wear bulky winter coats under their car seat harness straps (since this just adds slack into the harness system), you absolutely want to have coats on hand for any planned (or unplanned) stops along the way. And as someone very accustomed to airplane travel, I can assure you that the most predictable thing about the temperature in the airplane cabin is its unpredictability. Not only is it wise to dress your child (and yourself) in layers, but bring a few extra items in your carry on. Keep close tabs. Holiday travel inevitably throws off parenting routines. This means that you’ll want to pay extra attention to keeping a close eye on your child. When traveling by car, never leave your child alone or unattended – even for a minute, no matter how much extra time or effort it may take to have the whole family pile out of the car for what you were hoping would be a very quick pit stop. Whether on the road or in the air, also make sure your children have some form of identification with them, that preschoolers (and older) ideally know their own names (first and last) and a phone number, and that you have discussed with your children what to do in the event that you become separated. If your children have already entered the digital age and have cell phones, this is a great time to have them on hand as well.